‘Regina-style’ pizza is characteristic to pizza restaurants in the city of Regina, Saskatchewan, and Western Canada generally. The Regina-style differs from its Chicago cousin primarily in terms of crust depth, and the style of pizza-cut. Regina-style pizzas have a medium crust height, and are usually cooked on standard one-inch height pans. Regina-style pizzas are thicker than most other pizzas found in North America; they are usually topped with generous layers of standard pizza meats and (to a lesser extent) vegetables. Their thickness makes true ‘pie’ shaped pieces impractical, so Regina-style pizzas are usually cut ‘party’ style, most often in two perpendicular sets of parallel and equidistant cuts (Figure 1). On a standard 6-cut pizza, this leaves 4 ‘corner’ pieces, 8 ‘edge’ pieces and 4 ‘inner’ (crust-less) pieces. Extra large pizzas may have one more cut per set (for a total of 25 pieces). To date, the author is aware of no formal treatment of the geometric properties of the party-cut pizza. The following is a brief description of these properties without proofs, but observations will be studied inductively over the next 40 years by eating a large number of Regina-style pizzas. Therefore, the total number of pieces on the edges of a party-cut pizza is always equal to 2c. The number of inner pieces can be calculated by subtracting 2c from p.
The area of each piece (of all three types) of a Regina-style party-cut pizza increases as a function of diameter of the pizza for a given number of cuts, but decreases proportional to the number of cuts. Because the shapes of the piece types are different, a different formula must be used to determine the area of each type of pizza piece. Calculating the area of the edge (non-corner) pieces requires more information than simply the number of cuts and the diameter of the pizza. One way of calculating the precise area of each edge piece involves adding the area of a circular segment (A) to the area of a quadrilateral polygon (B) (Figure 2). Calculating area this way requires some extra measurement, however. It is also possible to calculate the area of edge pieces using integration and the measurement of an angle, θ (Figure 3). Finally, the area of the corner pieces is equal to the difference between the total pizza area and the sum of the area of inner and edge pieces. This entry was posted in Uncategorized on December 31, 2015 by Niko Yiannakoulias. A large chunk of my applied research history has been in the field of ‘child pedestrian injury’, which is basically injuries involving child pedestrians and moving motor-vehicles. This field saw an explosion of research (relatively speaking) in the nineties, so when I got into the field in the 2000s, many of the big questions had been answered. Nevertheless, I was interested enough in the topic to attempt to stake my own claim, and my participation in this research area is a (somewhat) interesting case study of how research can enter and exit a research program. Along the x-axis of this graph is collisions ordered by proximity where ‘1’ is the collision occurring closest in geographical distance, and ’30’ is the collision occurring farthest in geographical distance. Along the y-axis are correlations between collisions in time of day. Larger positive values suggest that the times that collisions occur are more similar, and larger negative values suggest times that are less similar. Values of ‘0’ suggest no correlation. The key information to take away from the graph is that the closer two collisions are in space, the closer they are in time of day. The relationship between space and time is not particularly strong, but it is measurable. It seemed to me that there were two possible explanations for this pattern. One was that since school operating hours dictate the time children are walking, and children who attend the same school tend to get struck in similar geographic areas, it makes sense that these children are also struck at similar times. The second explanation is that the timing of motor-vehicle traffic flow is geographically and temporally specific (high in some areas at some times, and low in some areas at some times), and that the risk of collision is influenced by this process of traffic flow. Our analysis suggests that it may be possible to achieve an almost 15 percent reduction in the total number of encounters between child pedestrians and motor vehicles during the morning commute by staggering school start times such that the periods of high pedestrian activity are temporally staggered from periods of high motor vehicle activity. Our analysis suggests that small changes in school start times could be sufficient to see noteworthy reductions in pedestrian exposure to traffic. The analysis I did in this paper was based on some empirical data on traffic and child populations, but also on some assumptions that needed validation. I sought funding for follow-up research to explore the question more fully, but that funding did not come through. After some careful deliberation, I decided that the idea had no more traction, and I put it to pasture. This ended my journey in research on child pedestrian injury, or at least this dimension of it. As it stands, it is highly unlikely any more work will be done in this specific research area; there is less research in child pedestrian injury these days, and moreover, the idea is complicated enough to discourage any casual forays. So the question will probably never really be answered with any more certainty than exists in the answers my past research in the area has provided. Thousands, if not millions, of research projects die this way–an idea germinates, develops for a while, offers some interesting preliminary results, but then is just not compelling enough to be explored to a natural conclusion. This could be because the impact of the research is low, or the methods are inappropriate, or the idea is just not that important to a large enough audience. Whatever the reason, at some point one has to surrender to the inevitable, and move on to something else. This entry was posted in Uncategorized on December 15, 2015 by Niko Yiannakoulias. As can be seen here, as wealth (measured as gross domestic product per capital) goes up, life expectancy goes up. 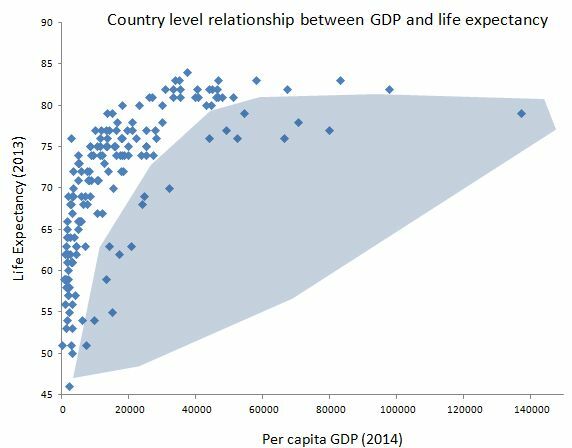 However the relationship is not linear; the benefits of wealth are mostly achieved at the median of global per-capital GDP, around 15-20000 USD. Wealth gains above this level deliver a diminishing return on health, if any overall benefit at all. This general relationship has been observed and commented on for decades (it’s sometimes called the ‘Preston curve’), and seems to be trending slightly upwards over time. The shape of the curve looks roughly the same whether or you’re measuring life expectancy, infant mortality, maternal mortality or a number of other health measures. While health is not the only important outcome of economies, it does speak, at least somewhat, to the ability of an economy to return value to its citizens. Countries in the shaded blue area are under performing–that is, should have higher life expectancy than they do based on their economic productivity. These countries are producing wealth that is not producing the same health benefits that equivalent wealth is producing in other countries. The economic productivity of the green countries returns the most to the citizens on a per dollar basis, and the yellow countries return the least. Of the green countries, only Luxembourg is in the class of what we’d typically think of as wealthy, and it (as well as several other countries on the green list) is probably too small to offer substantive insight about how to improve HROI generally. Most of the yellow countries are very poor, and struck by a mixture of political, economic and social instability that interfere with the building and maintaining of health infrastructure. 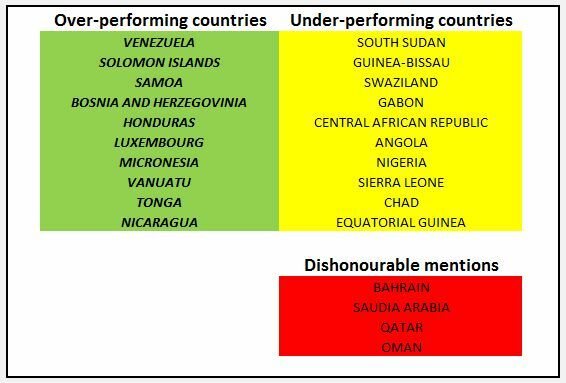 The red countries have low HROI and rank in a similar range as the yellow countries, but also happen to be obnoxiously wealthy, making their failure to perform on health particularly problematic. These four countries produce considerable wealth (almost entirely from oil exports) but this wealth is not returning as much to the population as the wealth of other countries around the world. Particularly noteworthy is the contrast between Venezuela and the red countries; for all of Venezuela’s challenges (of which there are a great many) at least for now, the HROI is considerably better than its OPEC contemporaries. Measuring health return on investment in this manner doesn’t answer many questions, but does provoke a few. For example, why are Central and South American countries performing (relatively) well in terms of HROI? How can resource wealth be better used to raise the living standards and health outcomes of the poorest citizens of the world? Why are some oil-rich states laggards in the effectiveness of translating wealth into overall population health? This entry was posted in Uncategorized on December 6, 2015 by Niko Yiannakoulias.